You are viewing the archived 2015 ratings for electricity providers. Go to the current electricity provider ratings. Looking for energy saving solutions for your home? Compare electricity providers using our customer satisfaction ratings. In our modern era of more and more power-hungry appliances it’s important to keep track of how much we’re spending on our electricity. In this case, the average Kiwi spends roughly $165 a month on their electricity bill, according to our latest survey results. Wellingtonians pay the most each month ($176) and those from Otago or Waikato pay the least ($160). a significant number did so for environmental reasons (15%). 2 in 5 Kiwis are super energy efficient, and switch off appliances from the wall when they leave their home. Given so many of us are finding ways to save, what else can you do to get the best deal possible? We recently asked New Zealanders what they thought of their electricity providers, based on criteria such as value for money, customer service, billing, payment options and more; each of which contributed to our overall satisfaction rating. Having crunched the numbers from the feedback of more than 1,800 Kiwis, we’ve found that Powershop has claimed our Most Satisfied Customers award for 2015. These local heroes out-paced the competition in all of the criteria we surveyed, and is also award-winning in this category for the fourth time running. Energy Online achieved a sterling four-star rating, whilst Mercury Energy, TrustPower, Meridian Energy, Nova Energy, Genesis Energy and Contact Energy each scored three stars overall. Value for money accounted was on eof the key drivers of overall customer satisfaction, making it one of the biggest considerations when choosing a power supplier. When it came to bang for your buck, it was Powershop who provided five star value. Energy Online scored four stars for the value of its rates and inclusions, and the remaining brands all scored three. Allowing customers to pay via different methods goes a long way to cater for households from different backgrounds – whether it’s through online banking or over the phone. The company that survey respondents were most satisfied with in this regard was Powershop, who scored our maximum five-star rating for payment options, followed once again by Energy Online with four. The other brands in our survey all scored three stars each for payment availability satisfaction. Whether dealing with a misplaced bill or negotiating a new contract, every customer appreciates clear, friendly customer service from their provider. Online, over-the-phone and in-person service was an area in which most of our surveyed brands did well: Powershop once again secured our five star rating, whilst Nova Energy, Meridian Energy, TrustPower and EnergyOnline all earned four-star accolades for their service. Behind these four were Genesis, Contact and Mercury Energy, all with three-star ratings. Similarly to customer service, billing is one of the key points of communication from provider to customer, and it’s important for monthly bills to have the relevant information and fees clearly displayed in a way that’s easy to understand. Accurate, legible bills are beneficial for both parties: they save customers from unwanted charges and companies from mountains of red tape and wasted time. 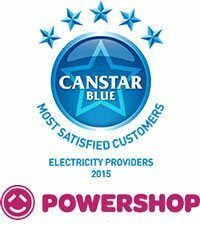 Powershop’s billing system was rated the best out of our New Zealand providers, notching our maximum five stars, followed by four-star achievers Energy Online, Mercury Energy and Meridian Energy – the remainder all achieved three stars. By not wasting power on things you don’t need, you get more in your back pocket and reduce greenhouse gas emissions. Energy companies know that the best way to retain customers is to save them money, and so we surveyed New Zealanders on how well their provider informs and advises them on how to save electricity on a daily basis. Powershop was found to have the most satisfied customers when it came to its education and advice programs, scoring a five-star rating. Mercury Energy and Meridian Energy received four stars for their information on power saving, and the remaining brands each scored three stars. Canstar Blue commissions Colmar Brunton to regularly survey 2,500 New Zealand consumers across a range of categories to measure and track customer satisfaction. The outcomes reported are the results from customers within the survey group who have an electricity account for which they pay the bills – in this case, 1856 New Zealanders.